When the US supplied M3 Grant and M4 Sherman tanks arrived in North Africa, it showed up the one major shortcoming of the British 6-pdr tank gun in that it could not provide effect high explosive fire support. As a result, field shops soon took it upon themselves to salvage 120 M3 guns from the Sherman and install them in the then new Churchill Mark IV tanks. This was the first use of the 75mm in British built tanks, and later saw the boring out of the 6-pdr to 75mm caliber to handle the same rounds. 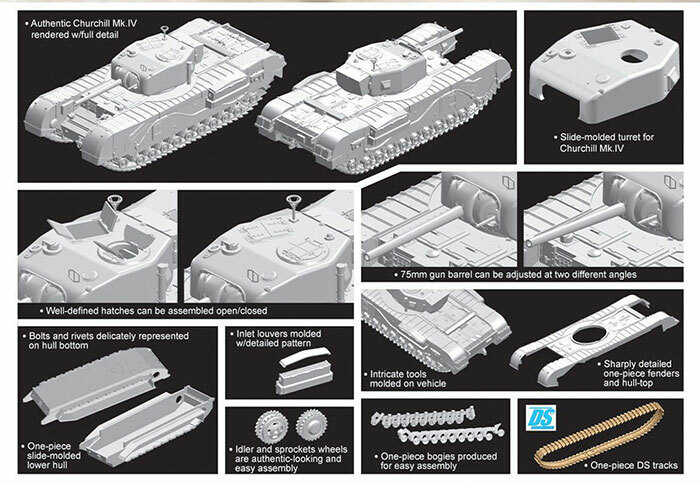 DML has now released a kit of this variant in 1/72 scale. 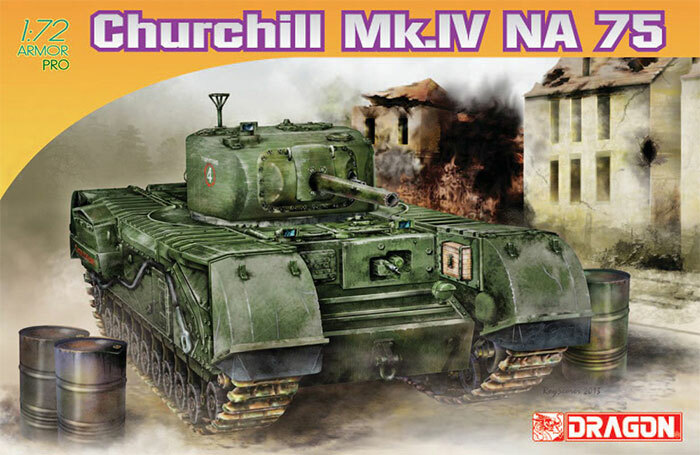 This particular Churchill kit swaps out the turret sprue of the welded Mark III for a cast version and all of the additional elements needed for the Mark IV NA 75 variant. Oddly, while it provides the complete M3 75mm gun installation with mantlet and mantlet cover, it also provides a late production 6-pdr barrel and the British built 75mm gun barrel as well as a normal M3 barrel. All are slide molded. Unlike the Mark III turret the Mark IV uses a shell and base arrangement. An antenna base is provided (A9) but no antenna recommendations are included for it. The hatches may be posed open and the cupola may be posed rotated. No interior is provided other than both the hull and turret Besa machine guns being complete, but this version does not use the turret Besa. This is one of the later DML DS Plastic track kits where DML indicates the proper length for the tracks is 205mm and advises stretching or cutting them to fit. The ones on the kit measured 208mm so may need trimming to fit. Three finishing options are listed: C Squadron, North Irish Horse, Italy 1944 (T number, red circle, white 4, “Castlerobin IV”); Unidentified Unit, Italy 1944 (T number, red triangle, white 3); and Unidentified Unit, Italy 1944 (red triangle, white 2). A sheet of Cartograf decals is provided. However, I admit to being no expert on British and Canadian markings.